Example of a nomadic work. Critical Art Ensemble designed this work to be performed at tourist sites and locations of extreme consumption. Note that such locations are heavily garrisoned and fortified, so only the slightest act of deviance is needed to provoke a coercive response. The performer selected a spot near an entrance/exit area at a public site, taking a position at the side of the entrance way so as to minimize blockage. In place, he began to set up a toy car track and then proceeded to push toy cars around the track. Other cars were displayed for anyone else who wanted to participate. Other collective members insinuated themselves into the crowd that developed, and spoke with the onlookers. The results: The crowd generally began by speculating on the mental health of the performer. Common themes were that the performer was “loony,” “on drugs,” or a “Viet Nam vet.” Some people would join the performer in pushing cars around the track, sometimes as a taunt, but mostly as gesture of sympathy. Within two to five minutes security guards or police would arrive on the scene. They would approach cautiously, fearing it was a disturbed person who might be prone to violence (the security forces were generally quite public about discussing the situation). The sight of security forces would attract more people to the scene. Security would eventually tell the performer to “move along.” The performer would ignore the command, and act as if he were oblivious to the people around him. Security would then threaten the performer with arrest if he did not move. This is the moment when the most interesting dialogue began, and the greatest understanding of public management emerged. 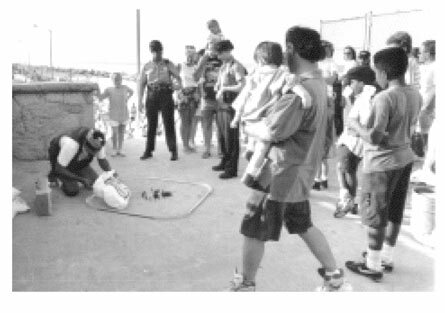 The spectators were suddenly confronted with the reality that a person was about to be arrested simply for playing with toy cars. On most occasions, the majority of people in the crowd would make verbal protests while standing in stunned disbelief, although in every case there were those who thought the police action was for the best, and that the performer really did need help. On one occasion, violence between the police and the crowd was on the verge of breaking out, and the performance was broken off prematurely. In all other cases, the performance was stopped just prior to arrest. Notes and figures: Cost of the performance-$10 for the cars and track; the theater space was appropriated; no performance experience was required.